range of defense and security equipment for land, sea, and air from 38 countries on display until Saturday (13/11/2010). 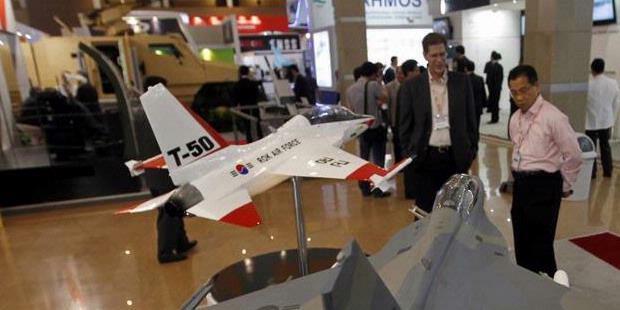 KOMPAS.com - Event Indo Defense 2010 making Indonesia one of the planes are interested in the Korean production, T-50. The plane was rumored to be one of the candidate aircraft to be purchased by Indonesia, to compete with Russia and the Czech aircraft production. "Some time ago, the Government of Indonesia expressed interest in the T-50. However, it still has not decided whether the Government of Indonesia will buy it. T-50 is still going to compete with Russia's Yak-130 production and the production of Czech L-150," said Sky Lee, Regional Manager International BD-Asia/South America Korea Aerospace Industry (KAI) on the sidelines of Indo defense exhibition at the Jakarta Fair 2010, Friday (12/11/2010).T-50 as one of Korea's flagship aircraft has several advantages, "This aircraft entered into the types of supersonic aircraft or high speed, in contrast with the Yak-130 is entered in the class of subsonic," said Lee revealed the superiority aircraft.This aircraft is one of the jet fighter pilot trainer for training the next generation. This aircraft was developed conceptually from 1992 to 1995. Meanwhile, his own aircraft development program starting from 1997. Total or Full Scale Development Development of the aircraft after the aircraft began flight tests through 1400. Meanwhile, his first own production starting from the month of December 2005.After passing through various flight test program, Lee said that another advantage of this plane is all about security. "The aircraft is managed through a test flight without any one accident. This proves that the aircraft is safe to use," Lee said in an interview with Kompas.com.Currently, Lee said, T-50 operated with ROKAF for advanced pilot training and is part of the Total Training System and the Ground Based Training System. Based on the analysis of ROKAF, specification T-50 is able to reduce training time by 20 percent, reduce costs by 30 percent, and increased pilot skill as much as 40 percent.Marketing KAI T-50 carried out in collaboration with Lockheed Martin Aeronautics. Lee said the T-50 supersonic trainer aircraft is the best. With system capabilities and performance, T-50 is one of the best platform for next-generation fighter pilot training.T-50 is equipped with multi-mode radar, water Close Support, and lock arms A / A and A / G. The aircraft is said to be also able to meet the needs of the Light Combat aircraft if needed. In Korea alone, T-50 has been used extensively with 57 units of aircraft have been used.About the price, Lee said, "The Government of Indonesia has a capital of 400 million U.S. dollars. If the Government of Indonesia decided to buy this plane, we can decide to memnjual package consists of 16 aircraft, training, spare parts, ground support, and technical support. "Lee said, Indonesia and Korea have a strong relationship because Korea itself has been buying CN-235 aircraft from Indonesia. So, it is hoped the relationship continued with the development of pilots using the T-50.T-50 aircraft is an aircraft specifically used for pilot training. There is also a version of another type that is equipped with a full arsenal for a ready to operate. However, T-50 aircraft can be modified by installing the necessary weapons without the need to purchase new types of weapons that have been completed.